Provides a generic raster algebra calculator featuring mathematical, statistical and conditional operators. In general, the output grid (parameter outFile) is derived by applying an algebraic formula (parameter formula) combining the values of one ore more input grid models (parameter inFile). The formula can either be specified as a generic filter or in python syntax. In the latter case the python interpreter is used evaluate the formula. By default, the output grid is created with the same pixel size as the first input grid, but an arbitrary pixel size can be specified using parameter gridSize. 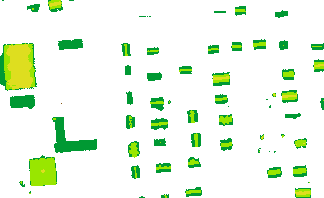 The extents of the resulting grid can either be specified by the user (parameter limit (left,lower,right,upper)) or they are calculated from of the outermost pixel centers of all input grid datasets involved. If no user defined limits are specified, either the common area (parameter limit intersect), the overall area (parameter limit union) or the extents of the i'th dataset (parameter limit dataset:i) are applied (c.f. section Parameter description for more details). Please note that Module Algebra can deal with non-coinciding models simultaneously. If necessary, the input grids/rasters are re-sampled according to the output grid structure prior to evaluating the formula (parameter resampling). To strictly avoid resampling, please specify resampling=never. This would lead to a program termination if any of the contributing input grid files would require resampling. The following sections describe in detail how arbitrary formulae can be specified in Module Algebra using either Generic filter or Python syntax. This section describes how to define the algebraic formula using the generic filter syntax. Due to the better performance, it is highly recommended to use the generic filter syntax whenever possible. Please note, that in the above formula only a single input grid is required which is accessed by r. In general, the grid/raster values are accessed by their index starting form 0 (first input grid) to n99 (last input grid). The result of the expression (i.e. a scalar value) is assigned to the corresponding output grid cell. In this case, the difference is returned for all those pixels where, both, r and r exist. If either of the operands is invalid (i.e. nodata) the resulting output pixel will be invalid (nodata) as the expression cannot be evaluated correctly. In the above example, first the condition (r*r<1.0) is evaluated and depending on the binary result of the conditional expression 0 or 1, respectively, is returned as result of the entire formula. Please note that if one of the operands in the above condition does not exist, the entire condition evaluates to false, i.e. the else branch of the ternary operator is returned. existence check: r checks the existence of the grid value; i.e, the grid contains a valid value at the respective location. invalid is returned if the (entire) conditional expression is "false", which results in an invalid (nodata) output pixels. ... returning the mean of all n valid input grids cells. Pleas not, that invalid grids cells (i.e., cell value = nodata value) are not considered for the statistical calculation. Only raster values (r[i]) and the grid location coordinates (x,y) can be used as input variables but no additional attributes. Assignments are only supported to store intermediate results but don't take an effect beyond the (local) filter operation itself. If assignments are used, the formula returns the first non-assignment expression. If only assignments are provided, the result (i.e., right side of the assignment) of the first assignment is returned. The only reason for using assignments in the context of an opalsAlgebra formula is to increase the readability of the formula. In the following example a "raster cell density" is calculated by first defining the number of involved rasters, secondly counting the number of valid cells and, finally, returning the cell density. According to the above rules, the formula returns cnt/n, where n and cnt are (locally) calculated within the first two assignments. Generic filters are a very powerful tool providing a set of arithmetic, logical and conditions operators and other features. A detailed documentation can be found here. None general void indicator (c.f. below for details). Thus, in the first line the statement r==None is equivalent to not r (i.e. r is invalid), and in the second line it is even allowed to skip the return value, as an empty return is equivalent to returning an empty object. Please note, that since Python is an indent-oriented language (in opposition to languages using parentheses for grouping), the blank characters before the return statements are mandatory. The same applies to the \nelif... sequence, where no blank is allowed in order to ensure the correct indentation. The grid model files are expected in GDAL supported format. The grid values of the respective models are referred to as r, r ... in the calculation formula. Grid file format, use GDAL driver names like GTiff, AAIGrid, USGSDEM, SCOP ... .
Estimation rule: The output format is estimated based on the extension of the output file. If neither outFile nor oFormat are specified, GeoTiff is used as default. Formula to compute a single grid value as a string in in Generic Filter or Python syntax. A formula must contain return a value (e.g. generic filter: r-r[r1] or python: return r-r)). For more details please refer to the module documentation. Value representing an undefined value in the output grid model. If -limit is skipped, the common area (intersection) of all input datasets is used. Method to be used for resampling the input grids to the specified grid structure of the output grid. Estimation rule: In opalsAlgebra, the output raster is processed block-wise. In general, for eachblock the pixels of all input datasets are queried, even if they only contain void pixels. The latter is typically the case in merging/mosaicing applications where the input datasets are either disjunct or only partially overlapping. To improve the run-time performance in such cases activating the skipVoidAreas flag allows ignoring blocks of all-void input pixels. Please note, that in this case the order of the input datasets is not strictly maintained which might lead to invalid results if the calculation formula explicitely uses input dataset indices (e.g. -formula r?r:r). However, for all formulae which aggregate only the valid pixels (e.g. -formula mean(r)), activating skipVoidAreas substantially speeds up processing. In the first example, the roofs of a digital surface model are extracted by applying a simple height threshold. All other values are set to void (no data). opalsAlgebra -inFile strip21.tif -outFile strip21_roofs.tif -formula "r>275. ? r : invalid"
opalsAlgebra -inFile strip21.tif -outFile strip21_roofs_py.tif -formula "return r if r>275. else None"
In this example, two grid models describing roughness (sigmaZ) and shadowing effects (excen), both by-products of the moving planes surface interpolation with /ref ModuleGrid, are used to create a binary grid mask (0..invalid,1..valid pixel). opalsAlgebra -inFile strip21_sigmaZ.tif -inFile strip21_excen.tif -outFile strip21_mask.tif -formula " r<0.1 && r<0.8 ? 1 : 0"
opalsAlgebra -inFile strip21_sigmaZ.tif -inFile strip21_excen.tif -outFile strip21_mask_py.tif -formula "return 1 if r<0.1 and r<0.8 else 0"
-formula "return r<0.1 and r<0.8"
opalsAlgebra -inFile strip31.tif strip21.tif strip11.tif -limit union -outFile mosaic_py.tif -formula "for x in r[:]:\n if x:\n return x"
This commands takes three input grids (strip31.tif strip21.tif strip11.tif), calculates the xy-extents of the output grid as the union of all input datasets (-limit union) and, for each grid post, returns the first grid point with a valid height (-formula "... x:\n return x") within a loop over all input grids (-formula "for x in r[:]: ..."). opalsAlgebra -inFile strip31.tif strip21.tif strip11.tif -limit union -outFile mosaic.tif -formula "mean(r)"
opalsAlgebra -inFile strip?1.tif -limit union -outFile mosaic_wc.tif -formula "mean(r)"
opalsAlgebra -inFile strip31_z_pdens.tif strip21_z_pdens.tif strip11_z_pdens.tif -outFile pdens.tif -limit union -formula "count(r)>0 ? sum(r) : invalid"
opalsAlgebra -inFile strip31_z_pdens.tif strip21_z_pdens.tif strip11_z_pdens.tif -outFile pdens_py.tif -limit union -formula "sum=0\nfor x in r[:]:\n if x:\n sum+=x\nreturn sum if sum>0 else None"
Contrary to the previous example, all valid point densities values are summed up and the sum is returned (if the sum is greater 0). Finally, opalsAlgebra is used for the derivation of a landscape dependent surface model as described in Hollaus et al (2010). Hereby, the single DSM pixels are either selected from a raster map containing the highest elevation within a cell (dsm_max.tif) or from a grid model calculated via moving planes interpolation (dsm_mp.tif) depending on a roughness map (dsm_mp_sigma0.tif, by-product of moving planes interpolation). opalsAlgebra -inFile dsm_max.tif dsm_mp.tif dsm_mp_sigma0.tif -outFile DSM.tif -formula " r < 0.2 || !r ? r : r"
opalsAlgebra -inFile dsm_max.tif dsm_mp.tif dsm_mp_sigma0.tif -outFile DSM_py.tif -formula "return r if r < 0.2 or not r else r"
M. Hollaus, G. Mandlburger, N. Pfeifer, W. Mücke: Land cover dependent derivation of digital surface models from Airborne laser Scanning data; in: "IAPRS Volume XXXVIII Part 3A", (2010), ISSN: 168299750; 221 - 226.